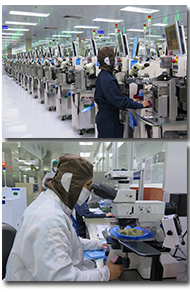 Hana Semiconductor (Ayutthaya) Co., Ltd. established in 1997 specializes in the IC assembly and test of low to medium pin count IC’s. We offer state of the art assembly processes (including Copper Wire, Chip on Lead, Multi-Die, Stacked Die, Clear Molding etc.) and test solutions. Our “leadless” package size starts from a 2 pin 0.6 x 0.3 mm to our popular package size of 40 pin 12x12 mm. Our leaded packages starts from our SOT963 with foot print of 1x1 mm to standard 24L SOIC. Besides standard packages, we also work with our customers closely to design and develop custom package solutions to address their specific needs. We provide custom package solutions for the MEMS, SENSORS, SIP (System in Package) and Hybrids/SMT, Multi-chip Modules, Isolation/Optocouplers, RFID/HOA, Optoelectronics and Clear Optical packages. Total installed capacity within Hana for IC packaging is ~ 20 million units per day and 80% of this is tested at Hana. 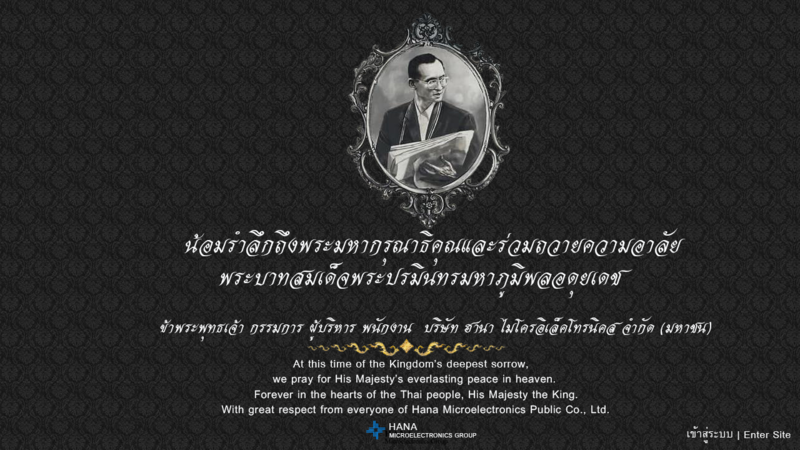 HANA Semiconductor (Ayutthaya) Co.,Ltd. Is ISO 9001, IATF 16949, ISO 14001, OHSAS 18001, ANSI/ESD S20.20 certified. The products are RoHS compliance. Coupled with on-going training programs initiated to enhance technical skills and TQM (Total Quality Management) techniques, our factory personnel have attained an awareness and maturity to compete aggressively in today's competitive environment. Please contact us at info-request@hanaus.com for more details and we look forward to working with you and providing you state of the art IC Assembly and Test solutions to service your needs.